Often, it seems like a Facebook event followed by a series of reminder posts for friends is ample promotion for a show. While regulars at house shows and rock clubs know to check social media and venue websites to stay up to date on local music happenings, there are other audiences that can be reached the old-fashioned way. Out-of-towners and others new to a particular music scene who see flyers posted in public places or are given handbills can find out about shows they would not necessarily read about online. Read on to find out more about the benefits of utilizing show flyers outside of the digital realm. While show posters remain relevant in the digital age, they sometimes are seen mainly online, be it on social media or a venue's website. Regulars at these spaces and friends of the bands are likely to see these postings, ensuring that a core of the audience stays informed of future shows, but not everyone who attends shows uses social media, or even the internet. A flyer posted at a laundromat, neighborhood pizza parlor, or other places with community bulletin boards or available window or telephone pole space can be a viable tool to reach new audiences. Smaller flyers that can be handed out at shows or in public can give a face to your band's name. Going to a like-minded band's show and giving out handbills can both reach a new audience and, in the process, let some know that if they attend, they'll see a now-familiar face onstage. Those who accept one of these small flyers may get a reminder later when they find it folded or crumpled up in their pocket or purse. In addition to reaching new audiences, going around with a stack of small flyers to share is also a good way to engage in conversation with those in your preexisting audience. 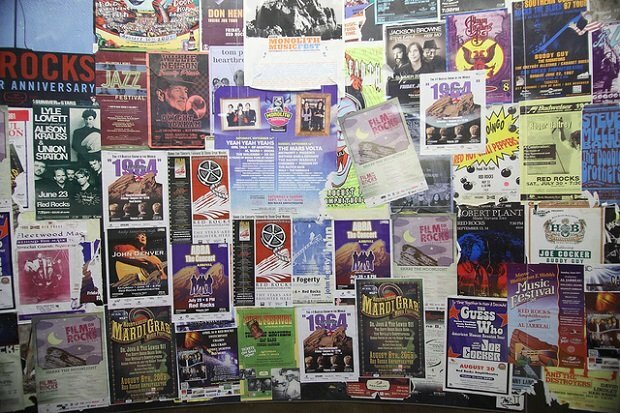 Sure, putting up flyers in strategic locations around town will take more time than throwing up a Facebook event, but eye-catching, clever artwork on posters that shares pertinent information about a show (bands playing, date, time, address, and cost) definitely serve a purpose – both on- and offline. A full-sized poster can draw attention to both your show and your scene. And as mentioned above, smaller versions of the poster can be passed out at shows and in other public spaces as a way to connect with friends, fans, and strangers. It's one of the oldest DIY ventures, but it remains relevant in the digital age. Do you think it's still worth it to put up flyers for your show? Let's talk about it in the comments below! Bobby Moore is a freelance writer and historian with an M.A. in public history (University of West Georgia, 2011). He's got a Dead Milkmen tattoo on his chest, and his three-year-old calico is named after the band Tacocat, so he’s pretty shameless about his music fandom.